CORDELE, Ga. (September 12, 2018) – It was announced today that Angelle Sampey of Team Liberty Racing would be teaming up with iWi, a plant-based omega-3 supplement company, heading into this weekend at the 34th annual Dodge NHRA Nationals at Maple Grove Raceway. Sampey will represent iWi for the first three races in the NHRA Countdown to the Championship starting this weekend at the 34th annual Dodge NHRA Nationals in Reading, Pennsylvania. 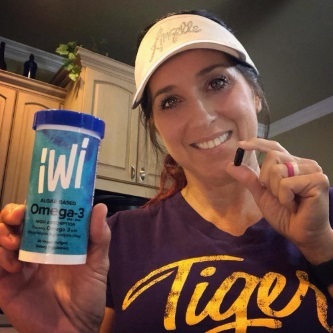 iWi is a premium wellness brand on a mission to revolutionize the way we nourish humanity and cultivate food by unleashing the potential of algae – sustainably producing important nutrients like omega-3 and protein using little more than arid land, salt water and the sun. By bringing responsibly farmed algae to consumers around the world, iWi is redesigning agriculture to sustainably feed everyone on this planet – in this generation and the next. The brand’s first product line is a collection of vegan, non-GMO and 100% plant-based omega-3 supplements with best-in-class bioavailability, with high-protein products planned in 2019. The iWi brand is owned and operated by Qualitas Health, an industry leader in algae cultivation.